Usually I don’t write about books I haven’t read, but for Michelle Obama’s Becoming I have to make an exception. Why? Because apparently her book tour is being treated like a concert tour called Becoming Live. Yes, Obama’s book tour has a title and the word “live” is part of it. A 12-city show promoting the publication of her book, Becoming Live is a cultural phenomenon that showcases the power and popularity of American’s former First Lady. In fact, the venues she’s slated to speak at are usually reserved for big deal arena rock, pop, and hip hop shows – i.e. Barclays Center in Brooklyn, the Pepsi Center in Denver, and American Airlines Center in Dallas, just to name a few. The capacity for said venues is 19,000, 18,000, and 20,000, respectively, which is insane! Also, ticket prices start at around $30 and go up to thousands of dollars – similar to prices fans would be paying if they wanted to see Chris Stapleton or the Foo Fighters. If that’s not enough, fans can also buy swag including books (of course) and t-shirts. And don’t kid yourself, the tour is produced by Live Nation and tickets can be bought through Ticketmaster. Are we sure Obama isn’t going to pull out a guitar and sing? If all of that isn’t impressive enough, Obama is also bringing a posse of famous friends on tour with her including Oprah Winfrey, Tracee Ellis Ross, Sarah Jessica Parker, and for those who live in Denver, Reese Witherspoon! 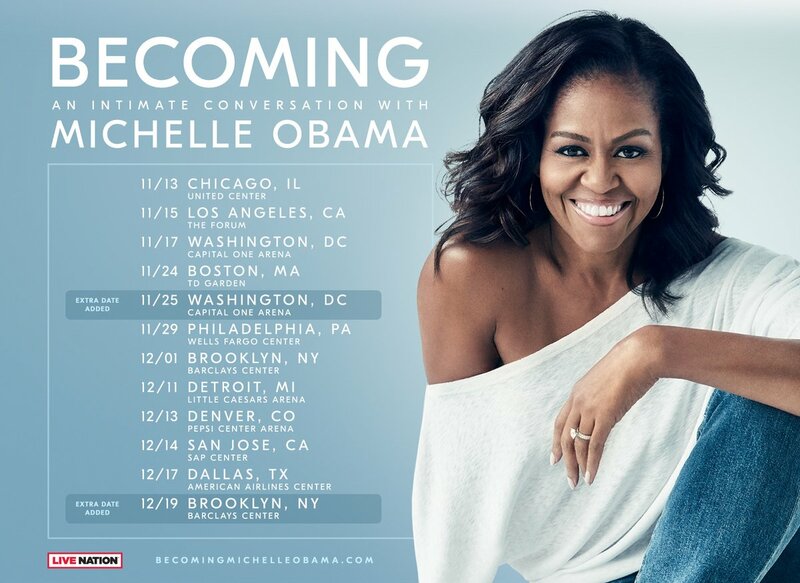 That’s right Denver residents – you can log on to ticketmaster.com and buy tickets for December 13’s Becoming: An Intimate Conversation with Michelle Obama Moderated by Reese Witherspoon at the Pepsi Center. And by intimate they mean you and 17,999 other people. Also, the VIP experience will set you back $995. So the question is whether or not seeing Obama “live” is worth it and if treating memoir tours as concert tours will become the new norm. I don’t spend a lot of time discussing politics but I am a Michelle Obama fan. I find her to be poised, well-spoken, intelligent, and someone who would be fun to hang out with – but not for $1,000 a ticket. That being said, I have no doubt that her tour will be successful as the release of her autobiographical memoir was arguably the most anticipated book of the year. On day one the book sold approximately 725,000 copies and 1.4 million in its first week. It will eventually be published in 24 languages and one million copies will be donated to First Book, an American nonprofit organization which provides books to children. Rock on Obama – you’re changing the face of book tours across America and most likely the world.